Early life. He lived in Sheffield, and worked as an architect. After serving in the army during the First World War, he returned to Sheffield and became a Tax Inspector. He was then transferred to the tax office in Witham (information from his obituary in 1941, for which see below). The date of the transfer could be discerned from the electoral registers. 104 William John Redhead of Nanteos, The Avenue. Long article about the opening of the new Peculiars’ (Evangelical) chapel in Guithavon Valley in Witham on 7 December. Photos of this and the previous chapel (Maldon Road). Scheme first thought up in 1921. Main hall will seat 175 people and schoolroom at back 80. Also vestry, kitchen and heating. Lighted by electricity and centrally heated. Cost £1,515. Sunday collections raised £710, and £25 was left by late Mr J Beadel. … Built by Messrs Richards and Sons of Witham. Architect W J Redhead of Witham. Practical assistance by members etc. 1933 ERO Acc A7280, Witham Building Plans, para 727. He designed the schoolroom at the back of the Methodist church in Guithavon Street (information from building plan). 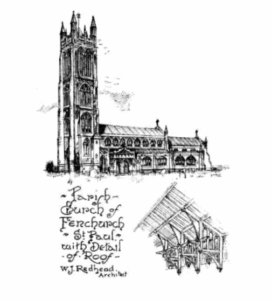 W J Redhead’s drawing of an imaginary Church, for Dorothy L Sayers’ novel “The Nine Tailors”.in 1934. Note by JG: the buildings mentioned above that Mr Redhead designed, do not form a comprehensive list. They are just ones that I looked for specially for various reasons. If he designed any other buildings in addition to the ones mentioned here, there will be information about them in the building plans at the Essex Record Office (Witham is ERO D/UWi ) But I don’t think they are catalogued yet, so it would mean unfolding each individual plan to find the architect’s name. Click on the blue words above. Then click on the strip that appears below it. John and Ann Lapwood are the best known of this family. In 1901 they were interviewed by the well-known writer and novelist, Rider Haggard. He was collecting information for his great work “Rural England”, and found the Lapwoods to have suffered from great poverty. Below is a copy of what he wrote. He told me that in his young days wages for horsemen used to be down to 9s, a week, and for daymen to 8s., when the weather allowed them to be earned. During the Crimean War bread cost him a shilling a loaf, and other food a proportionate price. He stated that for months at a time he had existed on nothing but a diet of bread and onions, washed down, when he was lucky, with a little small-beer. These onions he ate until they took the skin off the roof of his mouth, blistering it to whiteness, after which he was obliged to soak them salt to draw the ‘virtue’ out of them. They had no tea, but his wife imitated the appearance of that beverage by soaking a burnt crust of bread in boiling water. On this diet he became so feeble that the reek of the muck which it was his duty to turn, made him sick and faint; and often, he said, he would walk home at night from the patch of ground where he grew the onions and some other vegetables, with swimming head and uncertain feet. I asked if his children, of whom there were eight, lived on onions also. He answered no; they had generally a little cheese and butter in the house, but he could not put it into his own stomach when they were hungry and cried for food. ‘Things is better now,’ he added. Well, things are better now; indeed, it is scarcely too much to say that in many cases to-day, the labourer has more than his share of the rather plumless agricultural cake. But with such a record behind him, knowing what his fathers suffered, is it wonderful that he should strive to drive home the nail of opportunity, and sometimes to take advantage of the farmers who in the past too often were so merciless ? Let us try to understand his case and be just. Think, for instance, of this poor man Lapwood, whose condition was but that of ten thousand others, day by day forcing his hated food into a blistered mouth, starving that his children might be full. Think of him with his 9s. a week, and ten souls to feed, house, and clothe, while bread stood at a shilling a loaf. Remember, too, that from this lot there was no escape; that labour was in overflowing supply; and that to lift his voice against an employer, however tyrannous, meant instant dismissal and the hell of the poor-house – it was little better in those days – or the roadside ditch to lie in. Is it strange that, remembering these things, he – or rather his sons – should wax fat and kick, that they should be haunted also by the fear that the evil might return upon them, and bear in their hearts resentment, cloaked but very real, against those classes at whose hands they received that evil of which no subsequent kindness can obliterate the memory ? With the agricultural labourer, as I believe, this resentment against past suffering, at any rate as yet, is deeper than gratitude for present benefits. Indeed, gratitude is scarcely his strong point. Thus, to take the example of the family of this very man, I was informed that those children for whom he starved, did not do all they might to make his last days easy”. Next is a family tree of some of the Lapwoods. It is in PDF format, so you can alter it by clicking the relevant points on the grey bar on each page. To reach it, click on the blue writing below, and then on the longer blue strip that appears below it. Rider Haggard’s book “Rural England”, was written in 1901. He travelled all over the country to collect his information. The book starts with a long and detailed discussion about farming in England generally. Then he deals with each county individually, including Essex. I have included below, the part which talks about Witham, and particularly about the Strutts and the Lapwoods, very different families. Although Lord Rayleigh and the Strutts were based in Terling, four miles away, they owned a lot of land in Witham, including Blunts Hall, and held office in many organisations which included Witham. “A very typical Central Essex farm of the better sort was that of our host in that district, the Hon. C. H. Strutt, the well-known and able member of Parliament for the Maldon Division. Mr. Strutt held some 320 acres, whereof a fair proportion was grass, at Blunts Hall, the property of his brother, Lord Rayleigh, and kept a herd of cows, the milk of which he sent to London. In addition to the ordinary Eastern Counties crops, such as wheat, barley, and clover-ley’, he grew eating-peas for market, and, as is not unusual in these parts, various sorts of seeds. Thus in 1901 he had a field of radish seed, which was drilled in April and cultivated in the same fashion as mangolds – by cutting out, singling, hand and horse hoeing. Twenty bushels per acre, which should realise from £16 to £20, is a good return from this crop. The greatest enemies to the successful growth of radish seed are the small birds, especially those of the linnet tribe, which, notwithstanding any amount of scaring, will sometimes consume as much as half the yield. Another piece was planted with swedes for seed. These swedes are sown in August in beds and dibbled out about November. Twenty-four bushels of the seed, worth from 13s. to 16s. a bushel, is a good crop per acre. This seed is collected just before corn harvest, and its foe is canker at the root, which causes the affected plants to fall over. Some growers say that this crop will do as well if it is drilled and cut out in the usual fashion, which saves the labour of dibbling-in the plants from the seed-bed. Part of Mr. Strutt’s field had been treated thus, but certainly this drilled portion did not look so well as the rest. It may be, however, that the difference was caused by that section of the land being higher and more droughty than the lower stretch, which overlies a damp bottom – at least so he seemed to think. At any rate the experiment was by no means conclusive. A third field was given up to eating-peas of an early, dwarf variety, which grows without support. Of these peas, whereof many truck-loads are sent away daily during the season from Witham Station, a hundred bags, or 300 bushels, are considered a good crop per acre, but the earliest varieties seldom produce more than fifty bags. Their value varies very much: it may begin at 15s. a bag, or even more, and afterwards fall so low that the price realised will scarcely suffice to pay brokerage and railway charges. He told me that in his young days wages for horsemen used to be down to 9s, a week, and for daymen to 8s., when the weather allowed them to be earned. During the Crimean War bread cost him a shilling a loaf, and other food a proportionate price. He stated that for months at a time he had existed upon nothing but a diet of bread and onions, washed down, when he was lucky, with a little small – beer. These onions he ate until they took the skin off the roof of his mouth, blistering it to whiteness, after which he was obliged to soak them in salt to draw the ‘virtue’ out of them. They had no tea, but his wife imitated the appearance of that beverage by soaking a burnt crust of bread in boiling water. Is it strange that, remembering these things, he – or rather his sons – should wax fat and kick, that they should be haunted also by the fear that the evil might return upon them, and bear in their hearts resentment, cloaked but very real, against those classes at whose hands they received that evil of which no subsequent kindness can obliterate the memory ? With the agricultural labourer, as I believe, this resentment against past suffering, at any rate as yet, is deeper than gratitude for present benefits. Indeed, gratitude is scarcely his strong point. Thus, to take the example of the family of this very man, I was informed that those children for whom he starved, did not do all they might to make his last days easy. William Duncombe of Witham, Water engineer. His career as the Waterworks Engineer, as told by the records of the Witham Urban District Council, i.e. The troops referred to were billeted in Witham for training during the First World War. These are notes by me, Janet Gyford, not the original words. If the original words are quoted, they are in punctuation marks. page 323. Letter from Mr J Goodey re long hours ‘he and Duncombe’ were working because of summer approaching and the number of troops. Suggest Duncombe made full time, or otherwise additional pay. To Water Works Committee. Mr Goodey to have extra help during the War ‘by Mr Duncombe going to the water Works at 2 p.m. each day instead of 4 p.m. as heretofore’. page 327. Water works Committee, re extra help by Duncombe going in at 2 p.m. instead of 4 p.m., adopted. pages 329-30. Letter from eight employees of council for further increase in wages. Refuse. Applications for post of engineer received. Names given. Only one from Witham, William Duncombe. 3 others. Proposed to have interview and pay 3rd class rail fares. William Duncombe appointed at £2 10 0 with house, coal and lighting. Also to undertake the Inspection of Taps at £10 a year. Deputy clerk to arrange to compensate Mr Goodey for fruit trees left by him in the garden at the Waterworks. page 39. Re-arrangement of outside staff in view of a bulk supply of water being shortly taken from the Silver End Development Co Ltd’. W Duncombe now Waterworks Engineer. Offer him Working Foreman and free occupation of present house, also Tap inspector. £2 10s a week. page 88. Remove W Duncombe foreman from his house at the Waterworks Braintree Road to the foreman’s house at the Old Waterworks Newland Street now occ by Mr Hume, nearer to duties. Page 705. William Duncombe, one of Council’s workmen for 45 years, had to retire through ill health. Letter to be sent. page 465. William Duncombe, foreman, retired because of illness and doctor’s advice. Enquiries re his position afterwards. Not a good time to replace him. page 491 Re William Duncombe [mentioned before as retiring through illness]. Recommend making him Council’s Water Inspector at 7s 6d per week. Page 720. Finance and General Purposes Committee OK, though Councillor Cuthbe didn’t agree with paragraph re. William Duncombe. The Brush Factory was one of Witham’s most important industries in the mid 19th century. It had developed from Matthew Thomasin’s wooden patten-making business of the early 1700s (Pattens were rather like clogs, worn outside the shoe). The Works and the Yard were just off Newland Street (behind what are now numbers 67 and 83). In the Yard there were a number of buildings, including a mop manufactory and 15 or 16 houses, some of which were used for both living and working in. The most essential raw material for brushes, bristle from wild boars, was imported from Russia. The completed brushes were despatched far and wide. There were about twenty brushworkers in 1829, and fifty by 1841. It was skilled work. The Witham branch of the Brushmakers Society was particularly active. Like other similar groups, it was run by the members, whose contributions entitled them to receive sick pay and other benefits. They met first at the White Hart and later at the Swan. The national Society was a pioneer of trade unionism, which was then illegal. Its members followed a 1,200 mile tramping route round the country, looking for work. If they did not find any on the whole route, they were paid ten shillings unemployment benefit. In the list, Witham was the first stop out of London, and the local branch here would help travellers and newcomers following the route. William Kiddier, in his book The Old Trade Unions (pp.30-31), described an occasion when “the eyes of the Trade were on Witham.” In 1826 “The Society at Witham, with its 17 men, had for Secretary James Mount: one of the INTELLECTUALS. A name adopted by the Brushmakers for their best expounders of Trade Principles. The Witham Society sent James Mount as Delegate to London, where Witham was proposing new arrangements about sick pay and benefits. He slept 4 nights at the Clubhouse, April 11-14, 1826. A keen observer was Mount, and things he saw were dealt with in the Witham Society’s Circular. A lengthy document addressed to the Trade. Done in literary style. The collaboration of 17 Men – the Witham Society, all had their say, and James Mount put it together … The eyes of the Trade were on Witham.” In due course, the Society paid for some members to emigrate to America to find work, and Witham’s James Mount was probably one of them. The tramping system meant that Witham’s brushworkers mostly came from other parts of the country. In 1841 four out of every five of them had been born outside Essex (compared with only one in every seventy of the farmworkers). The strange accents, tarry smells, and self-sufficient welfare system must have made the brush yard a mysterious place to local residents. Much of the work entailed dipping the separate sections of the brush into a tub full of hot tar. But by 1851 the tramping system was waning and half the workers were Essex men, with a third born in Witham. The Thomasins themselves seemed destined not to fit in very well in Witham. This was quite common with factory owners – one of the several problems being that they usually paid more than the tradesmen, and especially more than the farmers. Also the factory owners were often nonconformists in religion (usually Congregationalists). The adherents of the Church of England considered themselves to be much superior to nonconformists. A more particular difficulty for the Thomasins was their alleged association with the Witham Fires of 1828-29. There is a fuller account in my booklet “Men of Bad Character” in the books category. Jane Eleanor, the wife of brushmaker James Thomasin, was the aunt of Edmund Potto. Edmund was accused of starting the fires with which some of the farmers and tradesmen had been suffering. James Thomasin paid for defence witnesses, including James Mount, a brushworker. They all said that Edmund was not guilty but insane. Edmund was found guilty by the jury of sending a threatening letter, but not of fire raising. The judge scolded James Thomasin and said that he should have looked after Edmund better. Edmund was transported to Australia. In the town, feeling was running high because the young boy James Cooke had earlier been hanged for arson when it seemed he was innocent. So for Edmund Potto not to be found guilty caused a lot of resentment, against the jury and against the Pottos and the Thomasins. The arrival of the railway in 1843 probably increased the profits of local businesses. After James Thomasin died in 1845, his son George took over, buying more properties and also helping the nonconformist cause in local debates. George wasn’t deterred by this. Appointing Samuel Spooner as manager and ‘commercial traveller’ at the Works, he moved his own family away from the yard into the imposing Roslyn House, at the best end of the street (now 16 Newland Street). He described himself as a ‘gentleman’ when he completed the 1861 census forms. However his neighbour, Joseph Howell Blood, was the registrar, and wrote him down as ‘brush manufacturer’ instead. George has posthumously had the last laugh – his great-great-grandson, Mark Thomasin Foster, was High Sheriff of Essex from 2003-2004. George died in his fifties in 1868, after trying to ‘doctor himself upon the homeopathic system’. Shops closed for his funeral and over fifty men and boys from the brush yard joined the procession. One of them, Thomas Farrow, had worked there for 55 years. George’s assets were worth nearly £45,000 (about £2 million at today’s values) in addition to land and buildings. His young son James was set to be a stockbroker and not a brushmaker. So his widow, Mary Elizabeth, persuaded some of her sister’s family, the Adnams, to come from Berkshire and run the brush factory with Samuel Spooner, the manager. So in 1869 it was “Messrs Adnams and Spooner’s brush manufactory”, who put forward a cricket team to play on the newly free Saturday afternoons under the Workshops Act. Not all of their opponents arrived and the Adnams won. The directory of 1870 still gives them as “Adnams & Spooner, brush manufacturers”. However, they closed after three years, in 1871. The two young men George and Ernest Adnams then left their father in Witham, and went to Southwold, on the Suffolk coast, to take over a brewery. George was restless and moved to South Africa, where is said to have drowned (or, in some versions, was eaten by a crocodile). Another possibility is that he came back to England, and was the George Adnams who was recorded blind in the 1881 census, when he was living with his uncle’s family in London. I have not investigated this further. The father of George and Ernest was another George Adnams. He stayed in Witham with his wife and daughters, and set up a fruit growing business. 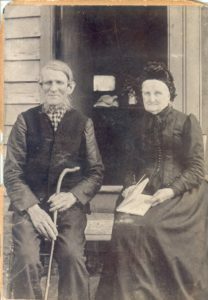 He was described in the 1881 census as “Farmer Of 120 Acres [with] 8 Men & 4 Women”. He was also on the Committee of Witham’s Co-operative Society. He sold one of the family properties to the Co-op for their first Witham shop (at 85 Newland Street). To many of the townspeople that was a particularly unwelcome body, undercutting the regular shops. George Adnams died in 1902, aged 84, and is buried at All Saints church (Holy Family). ‘One result of the suspension of business on Saturdays at two-oclock, at Messrs Adnams and Spooner’s brush manufactory, under the Workshops Act, was a match at cricket between eleven of the firm and what was to have been eleven of the firm of Messrs. Johns and Co., fellmongers, Witham and Chelmsford’. The Chelmsford people didn’t turn up so the latter team consisted of two from the Witham firm and others from Witham. The brushmakers won with 98 runs to 61. G Adnams got 0 and E Adnams got 6. From Poland to Essex. Wally Slugocki and the Second World War. My husband, Wladyslaw (Wally) was born in 1925, in Szwejkow, a small village in what was then Poland, but is now in the Ukraine. His father, Marion, appears to have done a bit of everything. Basically, they were what we would today call peasants. They had strips of land at the rear of their smallholding where they grew all their own vegetables as well as tobacco which they sold to the nearest small town, Monazteryska (not sure about the spelling) which was about 3-4 miles away. They also sold butter in the market of this town. They had a horse and carriage of some sort, some chickens, geese, and a cow. Wally’s family & his paternal grandparents all lived in the same house. There was no electricity, gas or sewerage. His grandfather’s brother lived next door. Wally’s mother’s parents were by then dead, but she had siblings living in the same village. Wally’s aunt, the much younger sister of his father, lived with her husband & small son only about 100 yards away. Wally remembers at the beginning of each November there would be snow about 6 foot high and it would not melt until early April. Water was obtained from a few pumps. There were Ukrainians living in Szwejkow at the time, and there were tensions between the two nationalities. Szwejkow had previously been in the Ukraine. Wally’s father had some sort of authority and had to sort out any problems which arose. In the village there were both an Orthodox church & a Catholic church. There was one school, & the two priests would come in and teach the children of their respective religions. There were also a couple of shops. When the war came, the Germans invaded Poland from the West & the Russians from the East. On 10 February 1940, the Russians came in the middle of the night and took the Slugockis to the nearest railway station in their own horse & carriage. The family had to leave just as they were, they were not allowed to take anything with them. Their dog was left behind. The Russians picked the Slugockis because Wally’s father was the Polish equivalent of the Town Clerk. Wally was fourteen, & his sister, Bronia, was seven. This trauma affected her whole life and she suffered terrible depression for a couple of years before she died. Wally’s aunt was not taken to Russia, she knew nothing about it until the next morning. It must have been a terrible shock to find that all her family had been taken. She believed that the Ukrainians had betrayed the family, and indeed, they removed everything they wanted from the Slugocki home. Aniela, the aunt, was still alive when we visited Szwejkow in about 2005, and the emotion, when she saw Wally, was something I shall never forget. The family were taken by train to Siberia, the Ural mountains near Sverdlovsk (in 2000, known as Yekatarinburg, home of Yeltsin). Wally remembers the conditions on the train as standing room only, there was just about enough space to sit on the floor. There was a hole in the corner of the carriage, which people had to use as a toilet, two men held a blanket across the corner of the carriage to afford a little privacy. The train journey lasted for 27 days. They stayed in Sverdlovsk, Siberia for one year. Wally’s paternal grandparents both died in Beresovsk, Siberia. The Camp was called Pervomayskoye- Oblast. Maria, Wally’s mother, had to work on a building site, and Marion (his father) worked in a gold mine, they all lived in one room. Wally remembers that they were paid for their work, and they had sufficient money to buy food. After some time, owing to an agreement between Russia & the Polish authorities, they were given documents enabling them to travel. In order to get to a warmer place, the family went by train to Uzbekistan, the journey took a week. There was a typhoid epidemic in Uzbekistan, Marion (Wally’s father) and Wally both caught it, and were taken to hospital in Tashkent. There, Marion died, next to Wally. Wally was still in hospital when his father was buried, he was not buried in a proper coffin, just a plank, then a piece of board on top of the body. There was no food in Uzbekistan, so Maria, Wally and Bronia (Wally’s sister) went to Kermine. Here Wally joined the Polish cadets, and was separated from Maria and Bronia. He was trained for the Polish army, under the command of Britain’s General Montgomery, and went to a port called Krasnovodsk, Asia. The civilians stayed behind. Wally got on a boat on the way to Teheran in Persia, and embarked at the port of Pahalev. Here Wally became very ill with dysentery, was in the sick bay in a field, and nearly died. From Pahalev he travelled by lorry to Teheran, over enormous mountains, the journey took a day. In Teheran there was a large disused factory, and the Army made a camp of it. Maria and Bronia were taken to Teheran as well, and when Maria made enquiries about Wally, she was told that he was dead. There was another Wladyslaw Slugocki who had recently died, and Maria found the grave in the nearby cemetery. However, a little later, she saw Wally in the town, but not to speak to, and she went back to the camp and found him. At that stage he was still convalescing. Maria and Bronia (Wally’s mother and sister) were staying in a civilian camp. They stayed there for three months, and came to see Wally every day during that period. Then Wally and the army were moved to Baghdad, Persia, and the civilians were later moved to Lebanon. They lost contact again. From Lebanon, the civilians moved to Kol Harpur, Valvade, near Karachi, India. 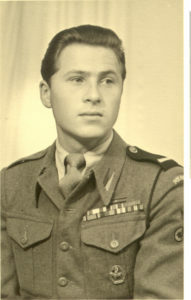 Wally stayed in Baghdad for six months, then he was picked to join the Parachute Brigade in England. He went to Bombay by boat, stayed there 3 days, then went to Cape Town, South Africa. From there he went by train to Durban, where they stayed for 8 months. Here he fell in love with bananas, and ate so many he nearly turned into one! From Durban he went by boat to Achtertui, near Kirkcaldy, Scotland. By now, the UK did not need any more recruits for the Parachute Regiment, so Wally joined the Army, and was in the 1st Panza Division, 10th Dragoons Brigade. By now it was 1942. He trained in Scotland for 18 months. They prepared for D Day by having huge manoeuvres for two weeks, which was exactly like the real war. 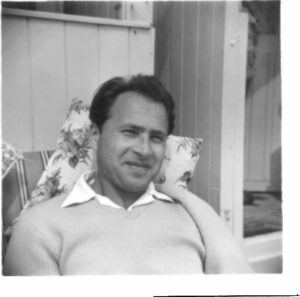 He travelled by lorry to Aldershot, got on a large boat at night in London Docks, and went to Normandy. He was part of the second phase. They landed on a beach in Normandy, he remembers most the dust and the thirst. He was in a light reconnaissance tank to spy out the land. He went to the first shooting line in Caen. The Germans were pushed out of Normandy. At Ypres, Wally was shooting Germans with a machine gun to stop them getting to a huge main gun, and for this he was awarded the Belgian Croix de Guerre. They pushed on to Holland, and the Germans retreated, leaving very many mines behind. When Wally was on patrol, his tank blew up. Wally was thrown into a ditch with heavy gear on top of him. His uniform caught fire, the tank driver’s legs were blown off and the other man in the tank suffocated. Wally scrambled out of the ditch, and managed to remove his burning uniform. An Army ambulance picked him up, but he was only grazed, and carried on fighting. They fought through Holland and stayed there for two months, over the worst of the winter, and had a bit of a rest. The place was Osterhuit, near Breda. Wally became very friendly with a Dutch family, and he went back to see them from Wilhelmshaven after the war had ended. They then pushed on to Germany up to Wilhelmshaven, where they stayed for a year in occupation. The whole army returned to England in 1947, after the severe winter. Wally went first to Hull, then to a big camp on Salisbury Plain, near Devizes. He was asked to go to Newton Abbott to clear fields of mines for the farmers. Here he met a girl-friend called Jean! After this, he went to Slingford Camp at Horsham, Sussex. He was later demobbed at Horsham. He was sent to Ashford, Kent, where, owing to severe dyslexia, and therefore unable to take the opportunity of further education, he worked on a building site. He lodged at 81 Essala Road, Ashford. The surname of his landlady was Glibbery. She was a war widow with two children, Shirley, 4, and Tony, 6. She had a boy-friend, and Wally used to babysit for them. He had to pay her 35/- a week, this included all meals, and washing his laundry. He remembers seeing the Golden Arrow engine pulling trains to Dover. By this time, Maria and Bronia (Wally’s mother and sister) were in Pulborough, Sussex, in a refugee camp. Wally heard that they were there, and went to see them. He went to stay with them for a week, he told his landlady, but not the Police. As he was classed as an alien, they had to keep tabs on him! After this, he lost the lighter building job he had had, and was given a heavier job, moving cement in a wheelbarrow. When he tried to tip the wheelbarrow, it went over and smashed some pipes! Then Maria and Bronia were moved to Rivenhall, Essex, to a camp on the now disused airfield. So Wally moved to Braintree, staying in a hostel. He worked on a building site in Panfield Lane for about three months, and then got a job at Felsted sugar beet factory, where he stayed about two years. He used to go by bus, it took about 20 minutes. Then he worked in a furniture factory in Sible Hedingham, which was a 6 mile bus trip. He then he went back to the sugar beet factory. He met a man in Braintree who was working at W J Bush & Co, at Witham. This man was moving to the Midlands, so Wally got his job. When he got there, a man was sweeping the yard. Wally asked him where the manager was, and it turned out to be George W Pole, who was the manager! By this time, Bronia had got a job and a flat in London, so Maria was on her own. Therefore Wally moved to Rivenhall. He started working at Bush’s on 21 May 1951. He went to see the Festival of Britain with Erwin Schulz and his wife. Wally and Maria stayed in the camp until 1959, when they were moved to a council house, 14 The Fortunes, Harlow, Essex. While there, he worked in Key Glass Factory. Then they moved to London, to live with Bronia at 66 Loftus Road, Shepherds Bush, where Wally worked at a factory in North Acton, making instruments for clocks. He had met me in 1959, as I was working at Bush’s as George Pole’s secretary. When Wally lived in London, he used to come down by train every Saturday, and we used to spend the whole day together in Chelmsford. When we married, we bought 254 Broomfield Rd, Chelmsford, and Wally and I both got jobs in Hoffman’s. Andrew was born while we were at 254 Broomfield Rd. Chelmsford. In November 1961, we moved to 34 Highfields Rd, Witham, where Louise was born. This was opened in 1964 to take the A12 past Witham. The A12 leads from London, to Lowestoft in Suffolk. page 430. Representation from the County Council re Ribbon Development. Proposes sterilising the ground between Hatfield Peverel and Witham, having a proposed by pass of Witham 1.67 miles long, and another 0.4 miles to the west of the Fox. Also a Rivenhall by-pass continuing it at 0.9 miles, as far as Durwards Hall. page 497. Surveyor has met Mr Giles of Essex County Council about the proposed Witham by pass. Ask that ‘point of contact with main road on Colchester side should be at Little Braxted Lane’. page 510. The County Council now propose to by-pass Rivenhall End. ‘Decision confirmed to by-pass Witham and part of Rivenhall in scheme for facilitating road travel between London and East Anglia. Witham tradesmen strenuously protest’. UDC Water, Highways and Works Committee, 16 December 1936 page 629. Notice from Essex County Council under Restriction of Ribbon Development Act 1935. Restriction of development on the line of the proposed Witham to Rivenhall End by pass. Details listed. Corner of Bridge Street and Howbridge Road. The County Surveyor wants it widened. The Committee thinks Bridge Street should be widened itself, instead of having a by-pass. Meet the County Surveyor. Proposed to say to the Ministry of Transport that ‘one motor way should be put down parallel with the London-Yarmouth Road to take motor traffic’, instead of loops round each place. This proposal was deleted by the full Council. [page 60] Recommend not approving the bypass and suggest a through-road from Gallows Corner to Colchester. Endorsed, see Council minutes 283 and 286. Trafalgar Square, 43-73 Maldon Road. Plan of boundaries for free delivery of letters, 10 December 1829. In Maldon Road is a square marked ‘new square’ which might well be Trafalgar Square. For sale by order of trustees under the will of Benjamin Elmy, deceased. Lot 1. 8 cottages in Maldon Lane. Fronted in white brick. Quit rent 4d. Occupiers John Boltwood, Samuel Everett, William Hart, John Savill, Thomas Chalk, William Bock, John Wilson, John Payne. Lot 2. 8 cottages similar to Lot 1 on eastern side of ground. Quit rent 4d. Occupiers John Pitcher, Jos Somers, Samuel White, Thomas Farrow, William Blake, James Cowland, Abraham Leigh, William Walford. Benjamin Elmy had died, had built 16 brick cottages. To sons William and John Elmy (see E.R.O. Sale Cat B703). Occupied by John Boltwood, Samuel Everitt, William Hart, John Savill, Thomas Chalk, William Bock, John Willson, and John Payne, and by John Pitcher, Joseph Sommers, Samuel White, Thomas Farrow, William Blake, James Cowland, Abraham Leigh, and William Walford. Wm and John Elmy sold to Edward Smith of Witham, linen draper. Occupied by John Boltwood Samuel Everitt William Hart John Savill Thomas Chalk William Bock John Wilson and John Payne, and byohn Pilcher Joseph Somers Samuel White Thomas Farrow William Lake James Cowland Abraham Mee and William Walford. Plot no. 289. Owned by Edward Smith. Occupied by James Boultwood and 15 others. Tenements and gardens. 1r 19p. 1897, Building plan (ERO D/UWi Pb 1/1 no 94)Wash houses, Maldon Road. Mr Hicks (owner). James Gamble (builder). Perhaps Trafalgar Square. 15 houses (average 6.3 per house). One house unoccupied. 1903- 1914, residence of Mrs Clara Jane Hammond, later Hubbard (PRO [TNA] BT 31/34043/1954, Witham Gas Co files. Two volumes). 1914 Clara Jane Hubbard, two £5 shares, transferred 29 Sept 1914, to Mary Ellen King Garrett. Trafalgar Square. This property is greatly improved and the small faults found are having attention. Manor of Newland. Compensation agreement with ‘John Douglas Dean of White Lodge Colchester, gentleman’. Typed list from Housing Committee 14 September 1932. Listing houses visited. 53 Maldon Road (Trafalgar Square). Mr H Wood. ‘Four room houses (living room, scullery and two bedrooms but only one bedroom fit to sleep in’. Sizes of rooms. Husband and wife. Three girls aged 18, 9 and 8. Two boys aged 13 and 6. One man lodger. Occupies two houses. 51 Maldon Road (Trafalgar Square). Mr F Dickerson. House as above. Husband and wife. Two girls aged 19 and 12. 2 boys aged 17 and 6. 47 Maldon Road (Trafalgar Square). Mr S Humphries. Husband and wife. Two girls aged 13 and 9. 3 boys aged 20, 14 and 11. 45 Maldon Road (Trafalgar Square). Mr O Chipperfield. Husband and wife. Two children aged 3 and 2. 61 Maldon Road (Trafalgar Square). Mr W King. Father. Daughter aged 16. Son aged 12. 65 Maldon Road (Trafalgar Square), Mr F J Wells. Husband and wife. 4 small children. 69 Maldon Road (Trafalgar Square). Mr C Ladkin. Husband and wife. 6 children, eldest 10. 71 Maldon Road (Trafalgar Square). Mr E G Cunningham. 73 Maldon Road (Trafalgar Square). Mr W J Wager. Two houses. … Signed J S Bradshaw Medical Officer of Health. G Ogden Sanitary Inspector. page 206. Trafalgar Square. Discussion some length about whether could be reconditioned for accommodating aged couples. Defer. Slum Clearance. Ministry of Health acknowledges receipt of partial programme and want the rest. 57-59 remain. 57 is better than the others. 59 is four bedroomed. 61, 63, 65, 67, 67a, 69, 71, all have bedroom over scullery ‘unfit to sleep in owing to the lean-to roof’. No proper food store, only one entrance door. Rec only let to aged persons. 73 has two bedrooms under lean to roofs and therefore not suitable to sleep and limit to small family. page 285. Sub Committee appointed re Trafalgar Square. page 169. Trafalgar Square. Undertaking received from owners’ solicitors to do agreed work. They haven’t done anything yet. Write. page 203. Trafalgar Square. The four owners agreed to make habitable. Only one returned agreement. Tell them that need by Saturday or will take action. page 251. Trafalgar Square. Details. Not settled yet. page 314. Trafalgar Square. Owners have undertaken to carry out alterations. page 357. Trafalgar Square. Undertaking to repair has expired and work not done. Recommend serving demolition orders. page 478. Legal proceedings re slum clearance at Trafalgar Square and appeals against parking places; appoint a solicitor to appear. Mr Bright is already representing the Court for the parking places appeal so can’t do it. page 500. Trafalgar Square. ‘Letter from Messrs Trotter, Sons and Chapman, solicitors for the owners … in consequence of proceedings taken by them, several of these properties are now vacant and their clients are prepared to commence the necessary work of renovation in accordance with the undertaking previously given to the Council’. Will the Council adjourn the hearing at the Braintree County Court. Recommend don’t agree. page 407. Nuisances include 34-73 Trafalgar Square, Maldon Road, drains obstructed, person in default is H Keeble Esq, 15 Mill Lane. page 592. Owners would sell Trafalgar Square to Council for £600 if Council bear own costs of present proceedings at County Court. No. page 682. Trafalgar Square. Appeal re-entered for hearing on 12 March next’. X 68 and X639, show Trafalgar Square, Maldon Road, in 1930s, probably when empty. From Mike Wadhams Vol I set 27 (ERO T/P 339). m1872 School Group with a house in Trafalgar Square behind. Q: I suppose not really, no. Was the Council school going then as well? Mrs I: Oh we didn’t go, yes that was Maldon Road. [hushed] Terrible place. Down Maldon Road. Trafalgar Square, oh. 20 Q: What sort of people were there there, then? Q: Did you, so you didn’t have much to ….? Mrs I: Well with fighting and bad language. Oh you mustn’t go there. Q: Really, you weren’t allowed to go down there, you mean? Q: So if they didn’t want, so if the chapel people didn’t want to go to the ….? Mrs I: Catholic, that didn’t go to the Board School, they went to these little schools. Q: So those were the people that didn’t want to mix with the others? Mrs I: Yes, that’s right, yes. Because it was, it was terrible. Mrs I: Well I’m afraid that was why I was very against the Witham Council. 23 Mrs I: Well, because that’s where those people came from. But of course you don’t like to be snobbish. Course, that is the trouble, but of course, the husbands can’t help it can they? They marry these girls, don’t they? They leave Trafalgar Square and go away, you see, that come back, these fellows, where they meet them, I don’t know, I suppose they meet them in the War time like I met my husband. Oh yes, you know the …. Oh I suppose it was all right, it was just that we, just said these things [probably referring to girls from Trafalgar Square, such as the Woods, marrying men from elsewhere who came back and got on the Council]. Q: You didn’t have anything to do with them, anyway?. Mrs I: No, no. You just kept by yourself. Typescript not checked. There is more stuff about the family on the tape. Mrs B: Well, they used to take old places didn’t they so, that was very old, you know? Mrs B: We lived there all my childhood days was spent there, we was born there, you know, and me brothers and that grew up, they all grew up …. Q: How many brothers and sisters did you have? Mrs B: I had, there was em, nine or ten of us (Q: Was there really?) There was George, Ted, John, (Mrs S: Alice. ), Alice, Emily, Esmund, Lill, (Mrs S: Fred. ), Yea, Fred and Ernie, oh, there was Vic, I think mum had about thirteen, I think she lost two, I think they’re all dead there’s only me and my sister at Ilford alive now. (Mrs S: No, it isn’t, Edmund’s still alive.) Edmund, yes, oh, I always forget me youngest brother, he’s 72. (Q: Laugh, Oh, yes, the youngest one!) Em, he lives at Brightlingsea. He was on the railway from when he left school, he went into signal box. Q: So what was your name before you married? Mrs B: I was born down Trafalgar Square. Mrs B: Well, you didn’t get no money did you, ‘cause I remember when my brothers all went to work, ‘cause my mother like, had two families, she had em, there was George, Ted, Fred, Bill, and my sister Emily and me older sister, they were all working and married and there was John, me, Alice and Lill and Esmund, all like at school age, you know, all g’n to school, so there was like a family grown up and another lot going to school, me dad was a carpenter, we always had plenty, you know, was fairly comfortable, you know, good meals and me brothers used to go out with the doctors a lot, one brother nearly lived with Dr Ted Gimson, Bill, what died, he em, he used to go out with him everywhere on the boats fishing when it wa’nt shooting season, when it was shooting season he used to go out with them then, you know, (Q: Oh.) yea, he used to live there, up there a lot, his house, well Dr Denholm’s[?] got it now hasn’t he? (Q: Gimson’s, they call it Gimson’s don’t they?) Yes, Dr Ted had that built, (Q: I see.) yes. Mrs B: Yes, I can’t tell these views, I know ‘em we lived in the row across that way. (Q: Yea.) We had two houses right in the centre, but this generally shows all the old sheds and gardens (Q: That’s right, yes.) what we [???] (Q: That’s a bit mean, isn’t it?) [Laughter] (Q: Because they looked quite nice, they looked as if they were quite solid houses?) Oh, they were good old houses, well, years ago they did, they built them better didn’t they? Q: You said you had two didn’t you? Mrs B: We had a double house, yes, we had two front doors, but they were knocked into one (Q: Yea.) and erm we had like, two front rooms, two kitchens, ‘cause they knocked, and the same upstairs, they knocked so you could go right through. Q: Was that especially for you? (Mrs B: Hm?) Especially for your family? Mrs B: We did, four bedrooms and four downstairs, yes. Q: So, still a, [???] still be quite a lot wasn’t it? That must be somebody’s back gardens mustn’t it, did you have much garden there? Mrs B: Nice garden in the front, we had, me dad had a beautiful garden, beautiful flower garden. page 8. ‘Maldon Division Liberal Council. Presentation to Mr W Pinkham. Yesterday the annual meetings of the Maldon Division Liberal Council were held at Witham … afternoon meeting … Mr Sydney Velden, the new agent, was introduced to the members. After tea a general meeting … they were met in a social way and not to discuss party questions. The Government were doing their best, and he thought they were unanimous in according them hearty support … appreciation of Mr Tweedy Smith’s services in continuing his connection with the party in that Division … Resolution … supported by the Rev D M Picton and Mr D B Smith. page 8. ‘Congregational School, Mrs Picton presented a dressing case to Mr J W Jones, treasurer of the clothing club, and a set of brushes to Mr A Rudkin, librarian of the school, on the departure of each for the Army. The Rev D M Picton gave the men a pocket testament each’. ‘Congregational Church’. Second anniversary of settlement of Rev Picton. Preaching. Including a full-length photo of the three Pictons). ‘Witham Bomb Tragedy. Inquest and funerals’. Deaths of Revd D M Picton Congregational minister, and Lieut James McLagan, R E, and serious injury to Mrs and Miss Picton’. Lieut billeted at the Manse with them. Showing a hand grenade at ten on night. The two of them killed outright. Mrs Picton injury to foot and Miss Picton to eye and arm. 17 panes of glass blown out of window. Rev Picton 52, Lieut 22, of 3/1st Highland Field Co., attached to the 1/3rd Lowland Field Co. RE. Walter Coker chair of jury. Inspected scene etc. and viewed bodies. Jacob Marsden Picton, draper of Westminster Bridge Road, his brother. Lots of detail. The Lieut an expert. ‘Remarkable demonstration of sympathy’. Cortege from Manse, ministers etc. Down High Street to church. Flags half mast and blinds closed. Interment in All Saints. ‘It is long since such a general scene of mourning was witnessed in the town’. Rev E M Edmunds of Hadleigh, formerly of Witham, there. Address. Miss Winifred Drake at organ. Relatives from all over. Sunday services described. Also ‘Capt Yuille, CF, at his open-air service, made an impressive allusion … also loss … McLagan’. Letter of appreciation by WCW of Witham. Tragic. Loveable, happy knack of making friends. page 6, col 6. The Picton Fund. The Picton Memorial Fund, the appeal for which was generously responded to by all classes, has now been closed, the sum contributed being £320. Mrs and Miss Picton are both making steady progress towards recovery from their injuries and shock. Info from emails from the late Alan Smith. His mother was Gwyneth, nee Picton, Reverend David Picton’s daughter, and his father was Leslie Smith. Just a few words on them to amplify what you have about the bomb accident and their part in the family. Rev. 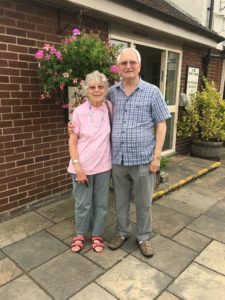 David was pastor at Halesworth in Suffolk where he married Elizabeth Rignall and where my mother was born before they came to Witham. As a result of the accident my grandmother had various metal plates and tubes in her legs and my mother lost an eye and had bits of shrapnel in her legs. After the accident they both went to live with the Misses Butler who lived at Hollybank in Guithavon Valley. Having been head girl at Milton Mount College (for the daughters of Congregational Ministers) then at Gravesend, she went on after the accident to the Royal Academy of Music where she won the medals for her years in piano and violin. Having married my father after WW1, her music as a farmer’s wife was limited, but much enjoyed, to running the Women’s Institute Choir and playing the piano at home. ‘What I do know is that when my father, Leslie, came out of the army and decided to be a farmer, grandpa Ernest sent him to the Writtle Agricultural College to learn the business and then bought Mounts Farm at Rayne for him to run. My father and mother [Miss Picton] were married (1921) and lived at Mounts Farm where I spent most of my first two years. (Mounts Farm is miles from anywhere so I was born (1923) at the Misses Butler’s house, Hollybank, Guithavon Valley, Witham where granny Picton was then living)’. In 1921 married Gwyneth Picton, dau of Cong min who had been killed in accident with hand grenade at the Manse in 1917. Elizabeth Mary Picton at Conwyl, The Avenue.